Bye-bye, Baltics! Lithuania is the southernmost, and alphabetically last, of these three little countries across the sea from Finland. While they do indeed have the roasts and fish and rye breads and casseroles common to this part of the world, happily there were enough local variations that I managed to do a rather different meal from the other two. (Note, no herring!) 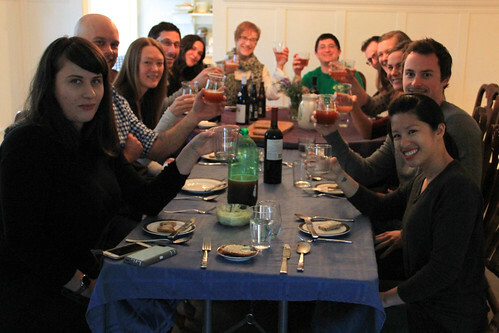 This meal was also a first in that we had a guest brewer — more on that below! Just as the Balkans cluster, so do some of our guests' names: we had Alley, Abby, and Andy, plus two Margarets! (OK, one of them spells it with two T's.) Non-conforming guests included Kevin, Maryann, Daniel, Lynne, and Susannah. Margaret and Daniel were on vacation to Portland and their visit perfectly coincided with a Nosh, we're glad it worked out! My friend Will's buddy Andy is a professional distiller and clearly passionate about all things related to the production of alcohol. 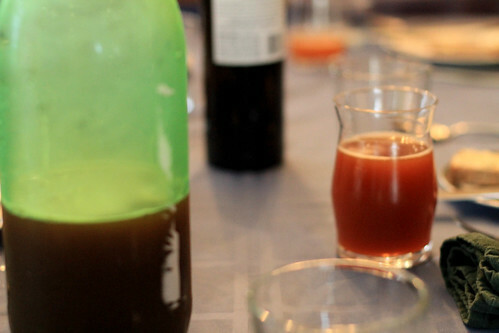 We sat down a few months back to see which Noshes we could make some booze for, and we discovered that Lithuania has a long, proud, and distinctive beer-brewing tradition. One variety that really intrigued us was this type that bakes loaves of malt. A quick detour to explain malt. To make beer, you need to sprout your barley — when the seed comes alive, it activates enzymes that turn some of the starch to sugar which the yeast feeds on and hence is why beer has alcohol. But you also have to stop the sprouting, and which requires heat, and it's that heat-arrested sprouted barley that's called malt. Almost all techniques go for a uniform heating, whether in an oven or in the sun or over a smoky fire, but the keptinis style, unique in modern beer-brewing, has the sprouted barley formed into loaves and baked. Just as with a loaf of bread, the outside parts are more cooked and toasty than the ones on the inside. There's other stuff involved too (hops, yeast, pressure, etc.) but as far as I can tell none of that was particularly different from normal. The beer Andy brought was simply delicious. I'm naturally inclined to maltier, roastier beers, so this was absolutely my kind of beverage. A beautiful copper color, a rich mouth-feel, not too bitter, and naturally a great accompaniment to the meal! And, of course, a nice toasty flavor, thanks to those loaves. So little work, so tasty! 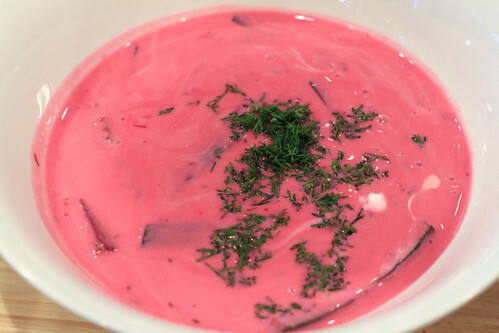 Boil your beets, chop 'em up along with some cucumber and herbs, and mix it up with buttermilk or kefir. (My research, and even this recipe, can't decide, and I figured kefir would be a little lighter and more approachable.) I added some of the beet-boiling water, to which I'd added stems, for the great color. Chill. Ladle into a bowl with some extra dill on top. Done. One taste of this vibrantly colored and delightfully flavored dish, and I knew I'd be making this again once the weather gets good and hot. Healthy, easy, inexpensive...those Lithuanians are onto something. These oblong dumplings, named "zeppelins" for their typical shape, were looking like they were going to be a ton of work. Grating 15 pounds of potatoes using only the fine part of a box grater typically reserved for ginger just seemed like a dreary pit of of time, effort, and scraped knuckles. Fortunately, I found a recipe (linked above) that advised simply puréeing raw peeled potatoes in a Cuisinart. Perhaps the texture wasn't perfect from that, but given all the other labor involved — peeling, squeezing liquid out of the potato slop, filtering out the starch from the liquid, and then making dozens of filled zeppelins — I was really glad to save that step. I made both ground-pork and cottage-cheese-caraway versions, and both were quite tasty in their own ways. The squeezed potato has a somewhat gummy and dense texture, you're definitely getting a lot of calories per ounce here! Adding to the calories was the indulgent sauce that I synthesized from several recipes and the gifts of the season: pork cracklings (as in, skin slowly rendered of its fat then crisp-fried in the same fat), morel mushrooms (quickly sautéed in butter), and sour cream. Pretty satisfying! Though I gotta say, simply boiling the zeppelins is a lost opportunity, and I've hardly met a Maillard reaction I didn't like. So after the meal we experimented with taking cooked zeppelins and giving them a quick pan-fry in a bit of that rendered lard — now, that was a tasty dumpling! I'll admit it, most of my motivation to make this came from the name. 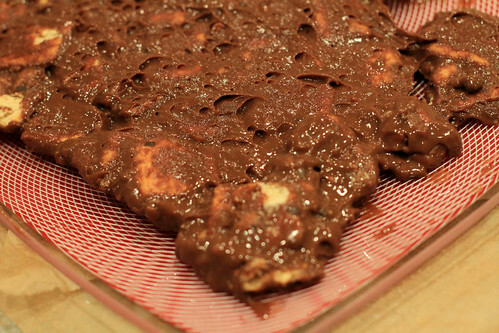 But I found several different recipes for this dish so I'm convinced it's a legit thing. I don't think I made it right. 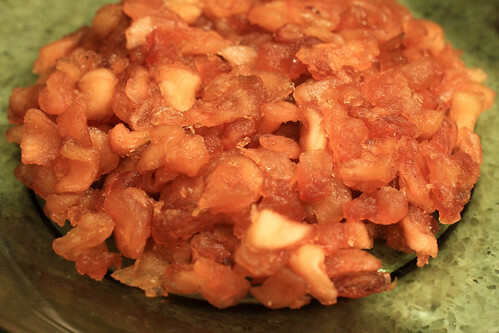 It's supposed to be a thick uniform mass, perhaps with the occasional apple chunk, but my version came out more like an inconsistent mass of semi-caramelized apple chunks. Not that that's a bad thing, 'cause it was certainly tasty, but it just didn't look like any pictures I'd seen. Should I have cut the apple chunks smaller before sugaring? Should I have waited more than a day for the liquid to leach? Should I have cooked the apples longer or shorter? Should I have put a weight on the cheesecloth-wrapped apple-mass to compress it? Maybe all of the above! But our dinner guests, having no idea what it was supposed to be like, sure liked it, and declared it'd be a great addition to a trail mix or oatmeal. It really seems like a stoner came up with this one, but legend has it that it was a housewife in the '60s who messed up with mixing chocolate into milk, and somehow butter and condensed milk and biscuits came into play. 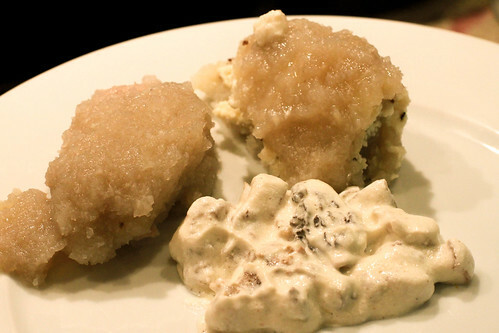 It's apparently a very common Lithuanian dessert, with as many variations as there are families. Its popularity is justified: it tastes every bit as good as this indulgent mix of ingredients would promise! I mean, unless you don't like things like butterfat and chocolate and that unique slightly-caramelized richness of condensed milk. It should have been firmer — the recipe says to freeze it if you can't find the right Lithuanian butter; while I did against the odds find Lithuanian butter, it clearly wasn't the right kind because we ended up with something goopy rather than firm. But it still tasted fantastic.